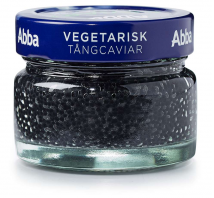 Distinctly black, beautiful seaweed caviar for food decorating. Spawn packaged in 80 g jars. 100 g of product contains: energetic value – 80 kJ (20 kcal); <0.5 g fat (from which: <0.5 g saturated fat acids); 3 g carbohydrates (from which <0.5 g sugar); <0.5 g proteins; 3.7 g salt.